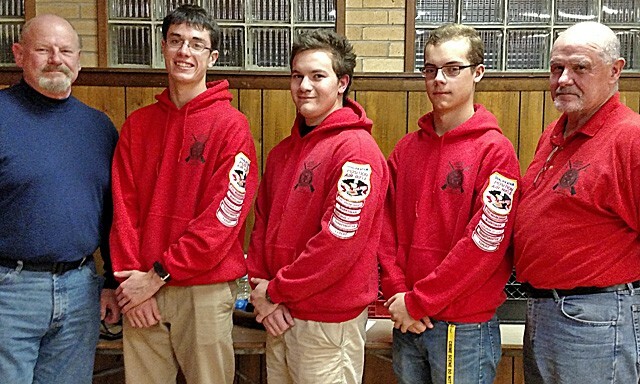 Three members of “The Warrenton Rifles,” American Legion Post 72’s junior shooting sports program, have earned the National Rifle Association’s coveted “Distinguished Expert” award for air rifle. Abram Baer, Sean Hardy and Sam Oravec each scored a minimum of 500 points — with 600 possible — in 10 competitions to earn the NRA’s highest certification. The John D. Sudduth American Legion Post 72 and the Fauquier County 4-H sponsor the shooting program. Pictured above (from left): Coach Claude Davenport, Sam Oravec, Abram Baer, Sean Hardy and Coach Mike Freeman.